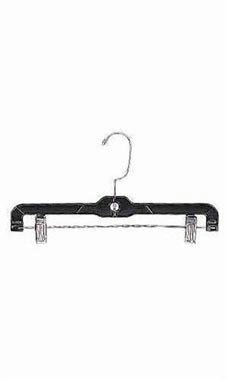 14" Black Plastic Skirt/Pant Hangers are an industry standard for displaying your retail merchandise. Our most popular hanger style, they are engineered for strength with added elastomers for maximum flexibility. These space-saving hangers feature securely anchored chrome swivel hooks and notched shoulders for hang bars and super strong padded clips.